Through the eyes of a Black male college student who barely withstands the relentless intimidation and ridicule of Hell Week, Burning Sands explores the controversial issue of hazing in Greek-letter organizations. 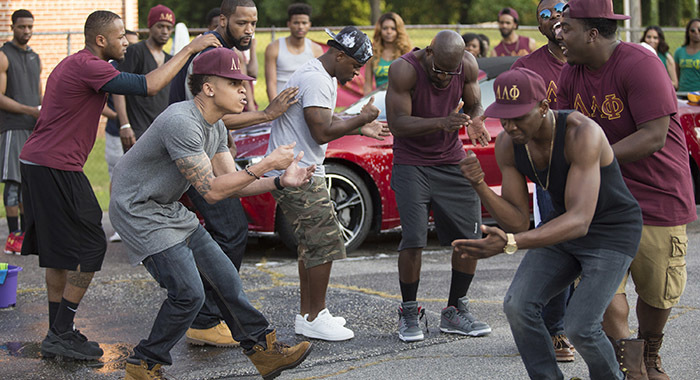 The film has elicited intense and polarized reactions from viewers, who report either closely relating to or vehemently disapproving of its portrayal of a historically Black fraternity’s pledging process. Generalizing a single fictional story to hundreds of active chapters of Black Greek-Letter Organizations (BGLOs) would be misguided, and yet, many have expressed that the film triggered haunting memories of very real experiences. It is fair to say that how one reconciles the film’s fictional elements with reality depends largely upon his or her personal experiences, but one thing is for sure: an outdated mentality against airing “dirty laundry” continues to impede upon and undermine solidarity amongst members of the Black community. BGLOs have been at the forefront of Black progress for over a century. When these organizations formed in resistance to Whites-only fraternities and sororities, they provided safe spaces for Black people, as well as incubators for ambition and talent in the Black community. They also offered a scarce source of dignity and pride in a society that denied Black people full citizenship. To this day, the Black community still preserves the legacy of BGLOs because each new generation continues to feel empowered by and indebted to the historical significance of these organizations. Given the vast number of pioneers affiliated with BGLOs, these organizations have served as one of the most notable beacons of hope for the Black community to aspire toward. However, we must not allow our deference to the past to obscure our perception of the contemporary issues that plague them today. Otherwise, we only stand in our own way of further building upon and strengthening the legacy of BGLOs. Following the premiere of Burning Sands, I witnessed tone-deaf defensiveness and tone-policing derail attempts to engage in well-intentioned dialogue about the film. I observed defense mechanisms that lead many Black people to purport unfounded accusations that sounded a lot like conspiracy theories: that Black people who claim to have been traumatized by experiences with BGLOs see the film as an opportunity to assassinate the character of certain members; that bitterness and jealousy about rejected membership constitute the only fathomable reason a Black person would want to call out hazing publicly; that the only purpose of the film was to soil the credibility and reputation of certain chapters of BGLOs. Initially, I attributed the controversy and knee-jerk pushback to blind allegiance; but on second thought, I realized that the problem runs much deeper. As far back as I can remember, I can recall many similar instances that had nothing to do with the controversy surrounding Burning Sands. The very mentality that leads people to shame the film for airing “dirty laundry” also stigmatizes honest and open discussion of mental health, intimate partner violence and sexual assault, HIV/AIDS, and queerness, within the Black community. We often sweep intracommunity problems and tensions under the rug, and even shun advocates of causes that prioritize these concerns. As it pertains to solidarity within the Black community, this mentality threatens my livelihood. The choice not to air “dirty laundry” almost always affects people like me, whose intersecting identities situate them on the margins of the margins of every minoritized group. Too often, I have felt pressured not to question the fairness and legitimacy of unreciprocated solidarity, for the sake of the Black or LGBTQ+ community’s collective interest. The pushback to Burning Sands reminded me that even within oppressed groups, solidarity centers around the values of members with the most privilege and status. They hold the authority to set the parameters of the agenda and then to take credit for winning victories on behalf of the entire community, while the rest of us feel exploited and shortchanged. Although many of my friends have witnessed Black fraternities mistreating queer people firsthand––mainly because some of them belong to chapters that do so quite frequently––they still silenced me for speaking out about my experiences. More often than not, Black fraternities have treated me with deliberate hostility. Whether that looked like Brothers refusing to shake my hand after I’d extended mine, or them throwing disgusted glances at me while I danced at their parties, members of some chapters sent me a clear message: the invitation into their space as a guest or the plus-one of a sorority sister was the extent of my welcome. They gave me a subtle warning that I dare not pledge. Therefore, many scenes in Burning Sands, like when a Brother yells in a new pledge’s face and screams disparaging sexist expletives at him for flinching, did indeed reflect the toxic masculinity that characterized my negative experiences with these organizations. Taken together, the parallels between this evidence and Burning Sands beg the question: Within the Black community, at whose expense do we defend institutions that perpetuate heterosexism and police people’s gender through shaming and violence? Moreover, how much longer will we excuse and exempt the homophobic culture of some Black fraternities, in the name of its legacy or the Black community’s solidarity? These questions matter because those who seem least affected by these issues rarely listen to those of us who share truths that make them uncomfortable and unsettled. Yet, ironically, many of these same folks bemoan the challenge of getting White people to interrogate white privilege, empathetically and theoretically. Urging Black fraternities to embrace more humanizing and inclusive definitions of Black manhood––and to demonstrate a consistent commitment to doing so––does not constitute an attack on these organizations. One can critique a culture or community’s beliefs and values from a place of deep care and concern. This is the perspective that myself and many others bring to conversations about Burning Sands and the toxic masculinity that some BGLOs endorse. We seek to hold BGLOs, particularly fraternities, accountable for living up to their espoused values only because of how much we wish to build upon and sustain their collective legacies. Doing so might necessitate airing “dirty laundry”. However, discouraging and silencing public discourse about intracommunity issues only undermines the robust and indomitable unity required to survive racial oppression while dismantling it. In the movement for racial justice, the sort of solidarity that will lead us toward liberation requires us to commit to amplifying and valuing the voices of individuals from all backgrounds, to receiving constructive criticism about our blind spots of privilege without defensiveness, to mustering up the humility to empathize and the courage to admit our mistakes, and most of all, to righting our wrongs with intentionality. DeSantis, A., & Coleman, M. (2008). Not on my line: Homosexuality in black fraternities. In G. S. Parks (Ed. ), Black Greek-letter organizations in the 21st century: Our fight has just begun (pp. 308). Lexington, KY: University of Kentucky Press. Anderson, R., Buckley, P.M., & Tindall, N. (2011). Black greek-letter fraternities and masculinities. In M. W. Hughey and G. Parks (Eds. ), Black greek-letter organizations: New empirical and critical thoughts (pp. 114-135). Jackson, MS: University of Mississippi Press.